Andrea Dovizioso produced yet another fine performance at Le Mans to step onto the podium in the French Grand Prix with a third place finish. The Italian rider, who started from the front row after going second in qualifying, got off to a good start and crossed the line at the end of lap 1 in second place behind Lorenzo, the eventual winner of the French race. 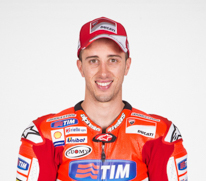 Dovizioso held on to second until lap 13, when he was passed by Rossi, and he took the chequered flag in third. Andrea is now third overall in the Riders’ championship standings. 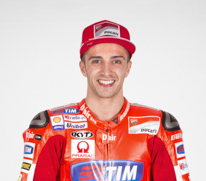 Team-mate Andrea Iannone, still feeling pain in his left shoulder which he injured last Tuesday during Ducati testing at Mugello, had an outstanding race. Thanks to assistance and treatment from the Clinica Mobile and his sheer determination, the rider from Vasto provided some exciting action during the race: he powered away well at the lights, finished lap 1 in third and then maintained the same place until lap 11. After being passed by Rossi, Iannone was running fourth, but exhaustion set in and he was then caught by Smith and Marquez, who both overtook him on lap 24. At this point, Marquez and Iannone provided all the excitement for the massive Le Mans crowd, trading positions numerous times, and in the end Iannone finished a well-deserved fifth ahead of Smith. 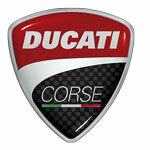 The Italian also lies fifth overall in the championship standings with 61 points. “I am happy because it is always very important to score a podium finish and the one I got today confirms once again that we are competitive. The conditions were good, but after the mid-point of the race I was no longer able to keep the pace of Lorenzo. Unfortunately the tyre had a drop in grip and I was not able to be as efficient as in the first half of the race: I thought my speed was good enough to get me to the flag and allow me to fight for the win, but it was not possible. This confirms that we are still missing a little something and, even though we have to be satisfied with another podium, we still have to work hard and make further improvements to the GP15”. “This was a really difficult race for me, maybe the most difficult of my career. At the start I was feeling fine, I had good pace and I was pleased with the way things were going. Up until lap 10 I was lapping quickly behind Lorenzo and Dovizioso, but then I began to feel pain in my left arm and had to use my right arm more to compensate. As a result I could no longer brake the way I wanted. I also made a couple of mistakes, losing some time, and I was caught by Smith and Marquez, with whom I had a really great scrap. In any case I've got to be pleased with today, because it was really difficult to finish the race, and I want to thank my team who gave me a really competitive bike that allowed me to obtain this result. A big thanks also to the guys in the Clinica Mobile who have been taking care of me all weekend”. “Today’s podium was the fifth for us since the start of the season and so we are really satisfied with it. Dovizioso was on really good form and ran a quick and smart race throughout to score another podium finish with the Desmosedici GP15. Iannone raced brilliantly, showing true character and, despite strong pain in his left shoulder, he had a superb battle with Marquez to finish the race in fifth place. Now that the French GP is over, from tomorrow onwards we will be beginning preparations for our ‘home race’, because we know that at Mugello there will be massive numbers of Ducatisti, and we want to try and give them even greater satisfaction than today”. 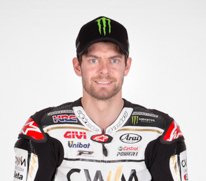 A dramatic change in conditions on race day at Le Mans proved to be to the detriment of Cal Crutchlow today, as the CWM LCR Honda Team struggled to match the strong form he had shown throughout free practice and qualifying for the French Grand Prix. After qualifying just 0.051 seconds shy of the front row yesterday the British rider struggled for front grip this afternoon as the sun finally broke through the grey clouds in northern France and raised track temperatures by 15ºC. Despite that Crutchlow was holding a strong position in seventh and biding his time for a late charge, which unfortunately never materialised after a mistake under braking on the 8th lap of 28. “Obviously I'm very disappointed with today. It seems all the Hondas struggled for front grip today but this wasn't actually the reason for the crash. My foot slipped off the rear brake pedal and as that happened I grabbed the front brake, which caused a big spike in the front braking and caused me to crash. “I'm really sorry to the team for that because I felt that in the latter part of the race we were due to come stronger and fight in the group that was immediately in front of me. 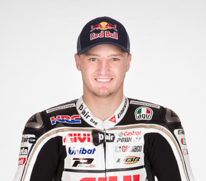 Jack Miller was unfortunate to leave the French Grand Prix empty-handed today as another strong and consistent weekend came to nothing after a crash on the 15th lap of 28 at Le Mans. Starting from 18th on the grid the CWM LCR Honda rookie made a strong start to the race, making up three positions on the opening lap and moving up to 12th by the end of lap two. However, with track temperatures up to 32ºC today compared to just 14ºC at the same time on Friday and 17ºC for qualifying yesterday, Miller found that his set-up was not ideal for the change in conditions and he started to lose front grip as the race approached mid-distance. Despite battling valiantly to maintain his position, the Australian slid out of contention in turn four, bringing to a premature end another otherwise impressive and informative weekend. “We had a great start and I was going really good, I was happy with the way the race was going. After about six laps I was right behind Hayden and Petrucci but I was having a few too many moments, I kept losing the front and so I decided to drop the pace a little bit. “It was still a decent pace but it wasn't what I needed, Maverick caught up and passed me so I tried to stay with him and see what we could do. About two laps later in the direction change at turn four I lost the front and couldn't save it. It's one of those things, the track temperature was almost twenty degrees hotter than we've had all weekend and we weren't quite prepared for it.